This post is brought to you by TIC TACS MINIONS! Minions have been SUPER popular in our household from the very beginning! What’s not to love about those banana loving humorous cuties?! I think Jenni and I can both confess that we also share the Minion obsession! We were both SO excited to hear about the limited addition TIC TAC MINIONS!! What a match made in heaven!! These yummy (yes, they are VERY yummy) TIC TAC will be FIRST launched here in Australia this month in May to celebrate the NEW Minion Movie (premiering 18th June, 2015…mark that date into your calendar!). Just like in the movie, the MINIONS are obsessed with Bananas therefore the TIC TAC MINION flavour is Banana! There are 3 characters in the movie Kevin, Bob and Stuart and so there are 3 different character printed on the TIC TAC pills. and I seriously felt like we were in a secret club when we received the parcel containing 6 TIC TAC MINION packs to review…it was like a scene from Willy Wonka! Minions have been described as “Impulsive creatures with little self-control” (Wikia)…this somewhat explains why my 6 year old daughter affiliates with them so easily…she managed to steal and consume a whole box of the LIMITED EDITION TIC TAC MINIONS in one night, this sent me into a mild panic when I realised we couldn’t actually purchase more of them until May 3rd! My daughter and I then had some fun making this short Stop Motion video using my iPhone – watch it here! 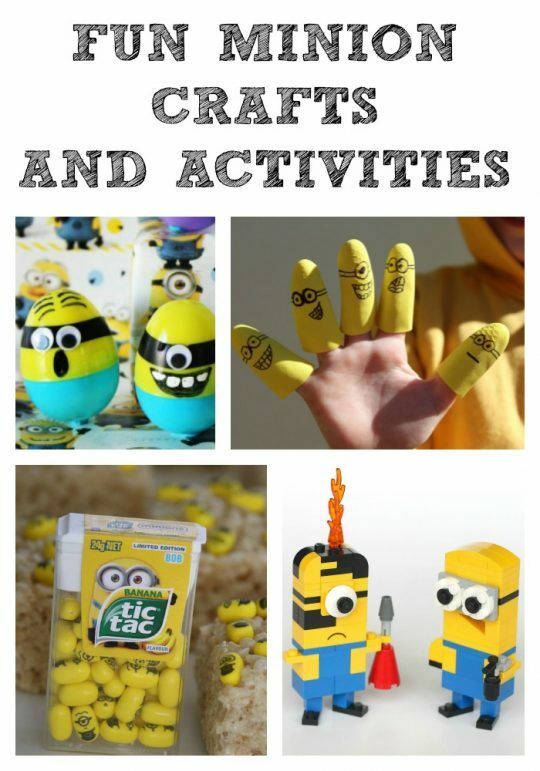 To get into the spirit of Minions we’ve collected some of our favourite Minion Crafts and Activities! Perfect for any like-minded Minion fan! This simple slice is an adaptation of the classic Rice Krispy Treat Recipe found here. 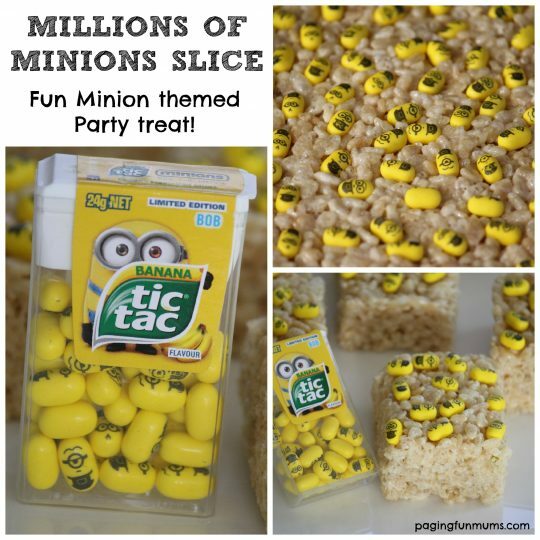 We simply sprinkled some TIC TAC MINIONS (3 packets) over the top and pressed it firmly down before it set! Perfect for everyone to enjoy (adults included!) at a Minion themed birthday party! DIY MINION PUPPETS – using rubber gloves! These have proved to be very popular in our households! So much FUN for bath time too! Watch how easy they are to create in our Video Tutorial here. DIY MINION COSTUMEThis costume would be so cool to wear to the Minion Movie premier! So much fun for a Halloween costume too! Find the images and full tutorial here! 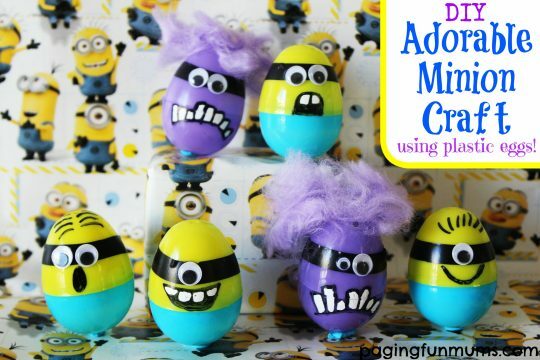 Here’s the perfect craft to use all the extra plastic Easter eggs! Perfect for storing your Minion slime too! Find the easy tutorial here. How cool is this! 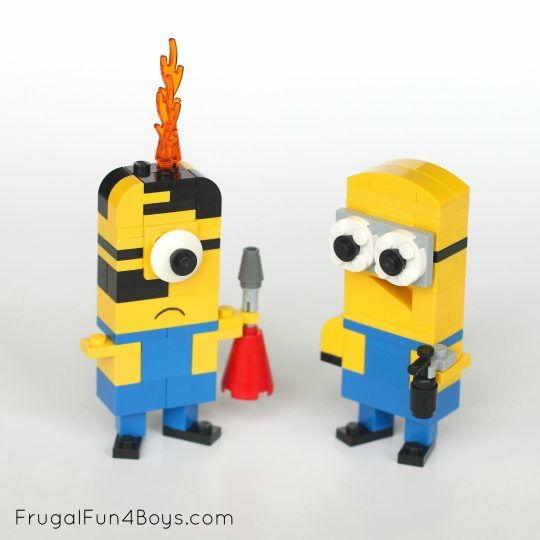 Make your own Minion Lego figurines! Find the easy instructions from Frugal Fun for Boys here! We hope you enjoyed these FUN Minion ideas! We also hope you enjoy the NEW LIMITED EDITION TIC TAC MINIONS as much as we did…just maybe don’t scoff a whole packet all at once like Miss 6 did ;). We are so excited to be giving away a family pass for 4 to see the Minion Movie! Entry is FREE and easy! Simply click the below link for your chance to WIN! T&C’s apply. « DIY Foam Paint – new video tutorial! Ooh so cute! I actually brought the Minion tic tac’s for my kids the other day, i couldn’t resist! Ooh so cute. I would love to get some of these tic tac’s but they do not sell them in Bundaberg:(. I would love to win the Movie ticket to the Minion Movie for my daughter. Thanks~~~ They are so neat! !